We offer creative garage organization systems and give priority to your requests and preferences. What's our final goal? We want to make the life of our customers easy. By installing the right systems, your children will be safe and so will you! You will have peace of mind by knowing that all detergents and sharp tools are locked inside cabinets. You will feel free to walk or spend time in the garage without tripping over rakes or the lawn mower. The floors will be free and so will you! When every item in the garage is properly organized, it will be found easily. We install overhead storage systems for things you don't use often. This way, you can still utilize the walls for hanging and organizing things for daily use on special slatwall systems. Our company offers both wall and ceiling storage solutions. We will examine the space in order to provide the best recommendations and solutions. Rest assured that we have plenty to offer. From shelves to cabinets and racks, we can create the right environment where every item will be properly organized. 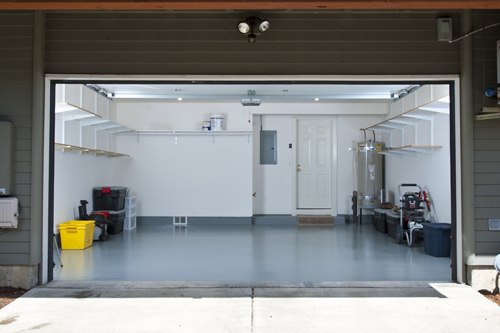 Additionally, we offer garage flooring solutions. Garage floors are usually the last thing people will ever think of replacing. Though, it's important to have a resistant floor which won't be stained easily and need only minimum maintenance. We install epoxy flooring so that you won't have to worry about its durability, cracks or stains. We are here to make your garage a beautiful, cosy, neat and convenient space. Send us a message if you have questions or want to hear about your options!